The 1860 United States Census offers a glimpse into San Diego County life at a time when California was just twelve years removed from having been a part of Mexico. Below is part of a page from that census showing the household of one Henry Clayton. The census indicates that Henry is 45 years old and his occupation is listed as “Ranchero/Stock Raiser.” It also shows that he owned real estate valued at $12,000. That was big money in 1860, and his $3,000 in personal property was a pretty big chunk of change at that time as well. The last column on the right shows Clayton’s birthplace as England. So, it might look like another case of an English boy who made good in California. But there are some complicated back stories behind these statements and statistics. English immigrant Henry Clayton originally came to California as a surveyor with the Mexican-United States Boundary Commission. The commission was set up under the treaty that ended the U.S.-Mexican War in 1848 to establish the new boundary line between the two countries. Clayton subsequently continued to work as a surveyor after the commission’s work was done. He served as surveyor of both San Diego City and County, as well as county assessor, for periods during the 1850s and 1860s. His work as surveyor undoubtedly put him in contact with the Californio owners of ranchos originally granted by the Mexican government. And Henry Clayton wound up marrying one of them. The name listed immediately below Henry’s on the census form, written in period shorthand as “Maria Ant” with a tiny a in the corner, was in fact Maria Antonia Alvarado Snook Clayton. Maria Antonia Alvarado was the daughter of a prominent San Diego family when she married Don Jose Snook, another transplanted Englishmen, in 1837. At his death in 1848, Don Jose was the owner of Rancho San Bernardo, covering 17,000 acres in north San Diego County. In 1853 Maria married Henry Clayton, and her role in owning and running Rancho San Bernardo was apparently and unjustly eclipsed–in the mind of the census taker anyway–by that of her new husband. But Maria remains more well-known in county history than the six other people listed as part of the Clayton household. Five of them are ranch employees, all natives of Mexico, ranging in age from 25 down to 14. The fourteen year-old, Antonio Bonia, is listed as a “monthly laborer,” as are two others, aged 25 and 16. Juan Navarro, 19, works as a “vaquero.” Another, listed only as “Alvarado,” is a shepherd. An 8-year old girl named Maria Alvarado appears to be a relative of one of the employees. 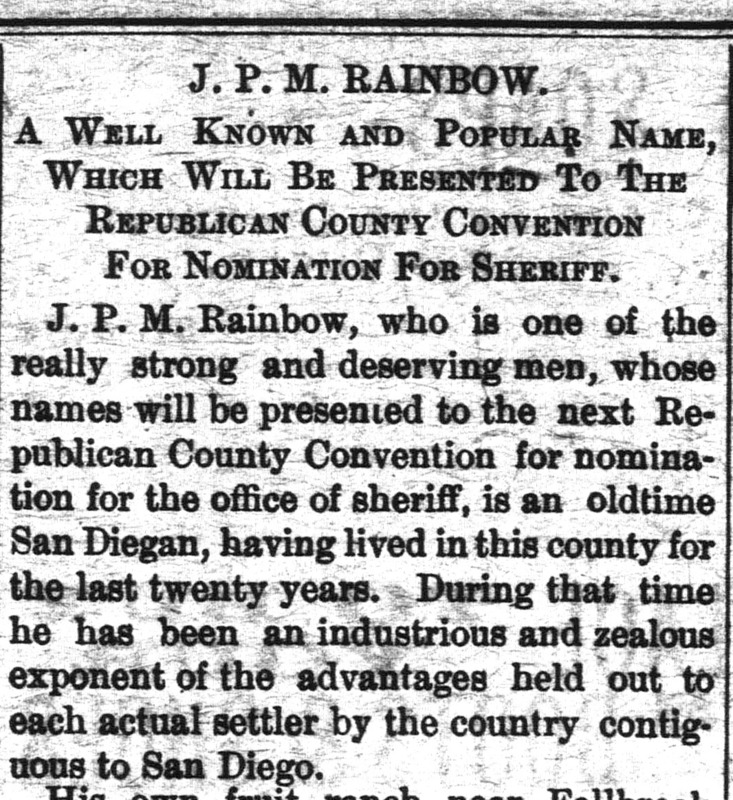 Sources for this post include the 1860 United States Census, the essay, “Joseph Snook: English Mariner, California Don,” from the Fall 1997 issue of The Journal of San Diego History and the 1908 book History of San Diego, by William E. Smythe. Due to mounting work demands, starting today I’m going to an every-other-week schedule. So look for the next new post on February 1. Feel free, in the meantime, to enjoy past posts or check out my books, offered for sale under the “My Books” tab. The story that follows was written by me in 2006 for the San Diego Union-Tribune. It was subsequently republished in my book From Field To Town: Chronicles of North County History in 2008. I present it to blog readers now in tribute to the memory of Bob Williams, who passed away on December 12, 2015 at the age of 77. Bob was an invaluable source on the history of the Poway-Rancho Bernardo area in the early to mid-twentieth century. He knew that history well because he lived it. He was a living bridge between the days of cowboys and cattle drives (which he participated in during his youth), and the development of the urban neighborhoods of today, which his family helped to develop. He was a successful businessman, but he was also a horseman and lover of the trail all his life. Thank you, Bob, for sharing your memories. The area of Poway encompassing the subdivisions of Valle Verde, Green Valley and Silver Saddle was once all Valle Verde Ranch. Rancho Valle Verde was a still-functioning but run-down ranch until the arrival of David Homer Williams in 1948. Williams gave the ranch new life. He also played a pivotal role in the transformation of Poway from an unincorporated rural area to a thriving city. Williams –all his friends knew him as Homer– was born in 1909, one of eight children born to a Tennessee farming family, according to his son Bob. Bob Williams, 62, runs a real estate consulting business and still resides in the last Poway house his parents lived in. When Homer was nine his family moved to Oklahoma. “It was tough going” there for Homer’s cotton-farming father, said Bob Williams. Around 1925, at the age of 16, Homer and an older brother headed for California. There Homer started working on the Murphy Ranch in Whittier tending horses and mules. He worked there for 18 years, rising to general manager. While working there in 1933 he married Elizabeth Nichols. They raised two children, Robert, born in 1938, and Julianne, born in 1943. From Murphy Ranch, Williams moved to La Habra, where he became general manager of the Imperial Ranch. When he came to Poway to become general manager of Valle Verde in 1948, the 1,280-acre property was in a state of disrepair, Bob Williams said. The ranch’s longtime owner, Dr. William Wickett, a physician and investor from Fullerton, had sold the ranch shortly after World War Two. The buyer reneged on payments and neglected to work the land, leading Dr. Wickett to foreclose. Within a year of Homer’s arrival, Wickett was so impressed with the improvements that he offered his general manager a one-percent ownership share in the ranch for every year Homer remained on the job. The two men developed “a strong friendship,” according to Bob Williams, so much so that Wickett “left almost all the decision-making with regards to the ranch up to my dad,” he said. Williams added grains to the ranch’s existing citrus operation. “Most of the citrus was on the hills,” said Williams. Low-lying areas, which were too cold for citrus crops, were planted in barley and oats instead. The ranch sold a lot of oat hay to the Del Mar Racetrack. From 1949 until his death in 1994, Homer Williams recorded the monthly rainfall at the ranch in a little black book. His records were so meticulous that in the early 1960s, Bob Williams remembered his father getting a phone call from the National Weather Service asking to make copies of the book. The service sent Homer Williams a new rain guage as thanks. The lack of a steady water supply became critical in the Poway Valley by the early 1950s. It was during this period, Bob Williams said, that his father approached his friend Dave Shepardson, suggesting they go to the Metropolitan Water District of Southern California for help. The district told Williams and Shepardson they couldn’t deal with individuals, only organizations. Out of that meeting evolved the Water Committee of the Poway Chamber of Commerce. That committee in turn evolved into the Poway Municipal Water District, which brought Colorado River water to Poway in 1954. Homer Williams served as secretary of the water district’s board of directors from 1954 to 1958, and as president of the district from 1958 to 1960. A steady water supply made Poway more desirable for residential development, and at Valle Verde as at other Poway ranches, farming began giving way to housing subdivisions. Homer Williams teamed with Wickett, Short and Shepardson to form the Valle Verde Ranch Company, which developed the first phase of Valle Verde Estates in 1955. Homer Williams was not through with farming, though. In the early 1970s, at the age of 62, he took up the offer of his friends, the Daley family, to clean up and manage 200 acres of avocados on the Daleys’ Escondido ranch. “He did that until the day he died,” Bob Williams said.